Heating maintenance isn’t just about staying warm on a cold day. It’s also about cost efficiency and safety. Keep in mind that a faulty HVAC unit can lead to harmful gas leaks, such as carbon monoxide from furnaces. This put you and your family at risk of low exposure carbon monoxide poisoning, which may cause symptoms such as dizziness, headaches, chest pain, and vomiting. Unmaintained heating systems are also known to work up to 20% harder to produce adequate heating or cooling. As a result, neglecting their condition may translate to higher utility bills by the end of the month. 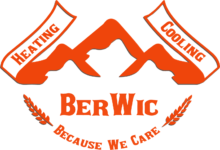 With Berwic, you don’t have to wait for these problems to present themselves. Book a heating maintenance service now for a performance you can rely on. With a heating maintenance plan from Berwic, you get routine checkups required by ASHRAE conducted by licensed technicians. To learn more, call us today at (587) 275-­4822.